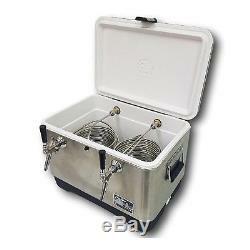 NY Brew Supply Stainless Steel Jockey Box Cooler - 54 Quart, 2 Faucet, 75' Coils. NY Brew Supply Jockey Boxes set the standard for the industry! Our Stainless Steel 54 Quart Jockey Box Cooler comes with Two 75' Stainless Steel Coils and Two Stainless Steel Faucets, with Faucet Extensions. It also comes with Stainless Steel Shanks and Stainless Steel Shank Flanges, for a neat, professional appearance. This is a top of the line Jockey Box Cooler, which will last for many years to come with proper usage. Dispense in style with this Stainless Jockey Box Cooler! Our Jockey Boxes are Made in the USA. Two 75' stainless steel coils, 5/16 O. Two Stainless Steel Faucets with Black Handles, and Faucet Extensions. All Shanks are Stainless Steel. 54 Quart cooler, with hinged lid and drain. Includes Bonus Faucet/Hex Nut Wrench. Comes with a built in Bottle Opener. 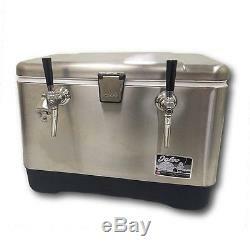 Our NY Brew Supply Stainless Steel Jockey Box Cooler with Stainless Steel Coils is perfect for dispensing ice cold beer at any party or event. Simply fill the cooler with ice and water, attach your keg(s), and you are ready to pour cold beer. Stainless Steel Coil jockey boxes are superior to those with cold plates because there is much more tubing, allowing for a much greater cooling capacity. This is our top of the line Stainless Steel Jockey Box Cooler, with all Stainless Fittings, and 75' of coils, which allows much better cooling of your beer than 50' Coils. Comes assembled with instructions for use and care. Also included is a Dual Faucet/Hex Nut wrench. Custom jockey box coils and coolers are available. We are here to help you resolve these issues as quickly and easily as possible. To ensure that your account is properly credited, do not return any merchandise without prior authorization from NY Brew Supply. Once an item has been used, it can no longer be accepted for return. Failure to do so may substantially delay the processing of your credit. Due to restrictions placed upon us by various manufacturers and laws, there are certain items which are not returnable under any condition. All food items are non-returnable, including: grains, hops, yeast, beer/wine/cider ingredient kits, cheese kits, vinegar kits, kombucha kits, etc. Some additional items may be non-refundable and will be listed as such in the item's description. NY Brew Supply offers premium quality wort chillers, jockey boxes, draft equipment and home brewing supplies. We specialize in custom built wort chillers and heating/cooling coils, and can design and manufacture a product to fit your requirements. We approach each new day with the following principles in mind. Provide quality products which will stand the test of time. Deliver exceptional customer service above and beyond what is expected. Offer fair and reasonable pricing. We are hard at work expanding our selection of quality homebrew supplies and draft beer equipment while taking care to maintain the level of quality and service which you have come to expect. We are happy to assist you with any product or order questions you may have. The item "NY Brew Supply Stainless Steel Jockey Box Cooler 54 Quart, 2 Faucet, 75' Coils" is in sale since Tuesday, January 17, 2017. This item is in the category "Business & Industrial\Restaurant & Food Service\Bar & Beverage Equipment\Draft Beer Dispensing\Systems & Conversion Kits". The seller is "nybrewsupply" and is located in Brookfield, Connecticut.